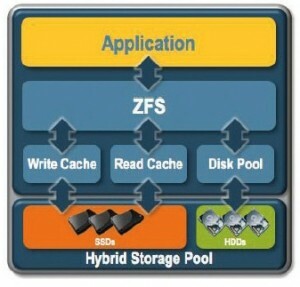 ZFS stands for “Zetabyte File System” and is a powerful storage system that combines a volume manager and a file system. ZFS is transactional, Copy-on-Write and always consistent. When new data need to be written, ZFS will use new blocks instead of overwriting the previous ones, so that the old version still remains available. Furthermore, ZFS works in a transactional way, similar to the databases. If you benchmark ZFS, all operations will be stored in a transaction group (TXG) and the queries will be executed in burst every 30 seconds. ZFS is 128 bits, rising its capacity to 256 quadrillion zettabytes (ZB), where a zettabyte is 270 bytes. ZFS loves RAM and SSDs, and knows how to use them. ZFS use RAM as smart cache (ARC: Adaptive Replacement Cache) and stores up to 4 cache lists: MRU (Most Recently Used), MFU (Most Frequently Used) and 2 others. The RAM is also used as a prefetch space and “Vdev Read-Ahead”, ZFS stores in RAM the data that you have the most chance to ask, so that the transfer can be as fast as possible. The first command creates the pool, while the second one shows its status and mounting point. A df -h will show you the free space available, which corresponds to the sum of the disks capacity (striping). The storage space is available and can be used directly but then you would miss the datasets functionalities. This will create the dataset and mount it automatically under the ZFS root, here pool_name (do not confuse with the OS root). creates a RAID1+0 made from 2 vdevs (2 mirrors). The -f is necessary to create a pool that has the same name as a previously deleted one. A scrub will verify the whole data contained in the pool, check their consistency and repair errors if any. The zpool scrub command should be run frequently with a cron. Once a week outside work hours should be sufficient. The pools can be imported and exported. During the reboot, the ZFS configuration is exported during the shutdown and then imported at startup. In a similar way, disks can be moved to another machine, a simple zpool import will allow to bring back the ZFS pool thanks to the configuration data stored in the header of the disks. The rebuild of a vdev is called a “resilver”. The commands zpool attach and zpool detach allow to add or remove devices from a redundant vdev (mirror). It’s not possible for the moment to lower the size of a pool (shrink). Amongst the properties of a pool, the most important ones are failmode, autoreplace and listsnapshots. The failmode describes how ZFS will react if anything goes wrong: WAIT for the problem to solve, CONTINUE even if there is a problem, PANIC to stop the system. Listsnapshots allows to show or hide the snapshots when a zfs list is issued (hidden by default). Autoreplace allows to automatically replace a defect drives by a spare one. will show all the commands that have been run on the specified dataset. ZFS reserves 1/64th of the pool capacity to save data used for the Copy-on-Write. The ZVols are datasets representing a volume instead of a file system. This volume can be partitionned, formatted in ext3/ext4 or other, and can be created in “thin provisioning” (sparse). ZVols are used with iSCSI to provide LUNs. The used disk space represents the space used by the data, while the referenced disk space includes also the space used by the snapshots. The quota will set a limit, while the reservation will pre-allocate space. As an example, you will prefer to use a quota for simple users and a reservation for VIPs. ZFS uses dynamic block sizing, but the maximum size is specified by the record size. This property should not be modified, unless you are doing some fine-tuning for databases (if it’s the case, you will prefer a record size of 8k). It’s not recommended to disable the checksum because it provides a data integrity mechanism while its impact on the overall performances is very low. Set the number of copies to create during data-writing. This is only useful when you have a pool of one disk and you want to have many copies of your data in case an area of the disk gets corrupted. If the snapdir property is set to “visible” (instead of “hidden”), you will see a directory called .zfs that contains all the snapshots directories. Thos directories can be browsed like any file system (in read-only) to recover data. The rollback function allows to restore a snapshot and cannot be undone. the more recent snapshots are then lost. The clone function creates a dataset (read-write) from a snapshot. This clone acts exactly like a normal dataset, except that it’s not taking any space. This is useful to test an environment with older data without any impact for the actual data. A clone can be promoted to break dependency with the previous dataset and have its own. Here we sent the snapshot through ssh on another machine, but we could have aswell sent it to an encrypted file. ZFS allows to easily share datasets via NFS, CIFS and iSCSI by setting the corresponding property to “on”. The ZFS system is very simple and it’s not its only strength. The mechanisms hidden behind are the product of an efficient reflexion that has led this project to a strong solution. This will for sure modify in a good way the habits of the system and storage admins.